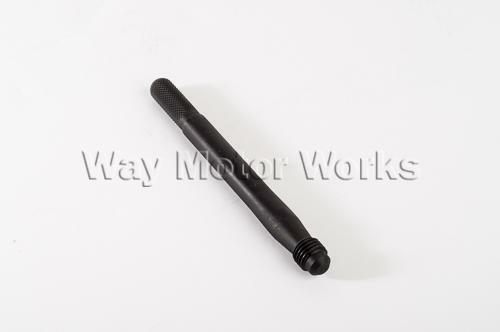 Wheel Hanger Lug Bolt Guide Tool for all year MINI Coopers. If you're a do it yourself mechanic this tool is a simple very helpful tool. Since the MINI uses lug bolts to hold the wheels on when you go to install the wheels you'll find the wheel doesn't stay in place very well and can fall right back off before you can start the lug bolts. This tool is a huge help for this problem as it will screw into one of the lug bolt holes and will allow you to slide the wheel on this guide through one of the lug bolt holes. The lug bolt guide is slightly tapered to allow the wheel to slide up into place and onto the hub. After you slide the wheel all the way on you can easily hold the wheel in place or it will sometimes even stay by itself and allow you to easily start the other three lug bolts. After you get them started you simply unscrew the lug bolt guide tool and install your fourth lug bolt. Sold as one Lug Bolt Guide tool for 12mm or 14mm lug bolt hub.